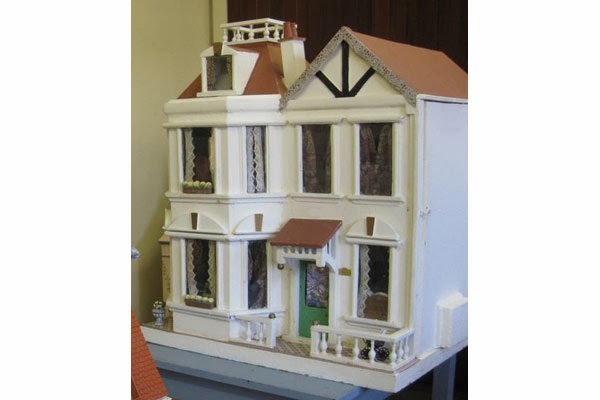 A Wonderful 1940s Terraced House & Grocery Shop By Susan Collins Of Essex! 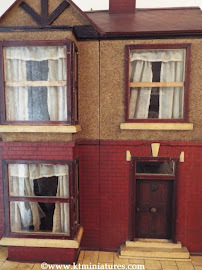 A long standing customer of KT Miniatures, Susan Collins from Essex, has for months now been excitedly telling me about the progress of her 1940s terraced house. 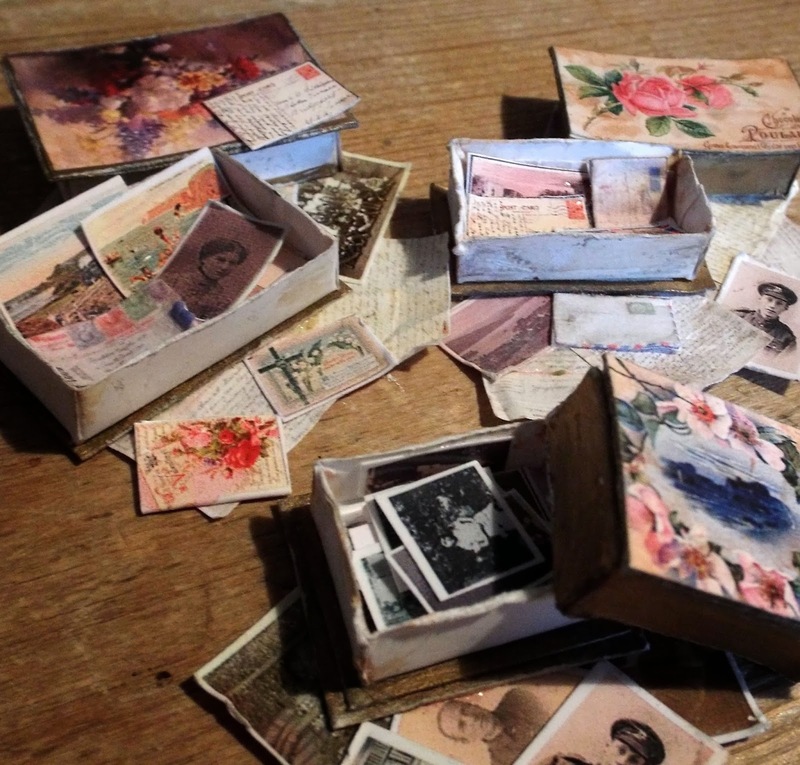 Then over the past week photos began to arrive into my "inbox" from Susan and well....they have completely blown me away! 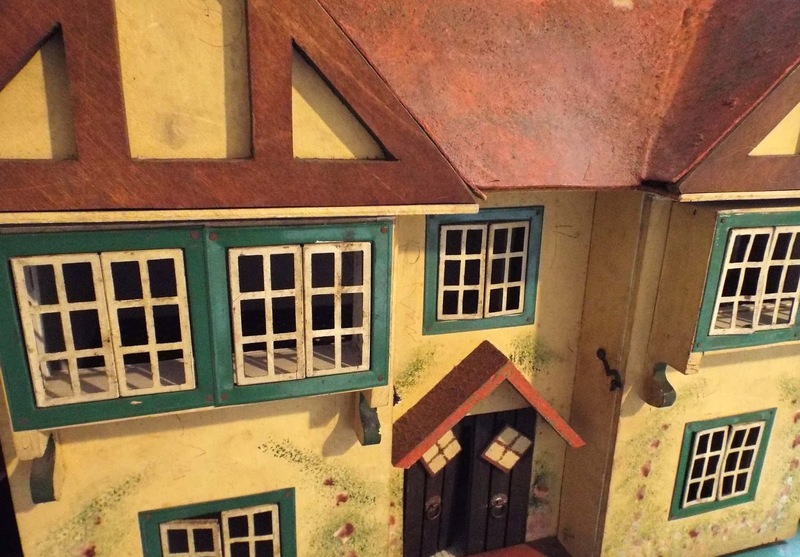 As you will see below, her projects are simply breathtaking! 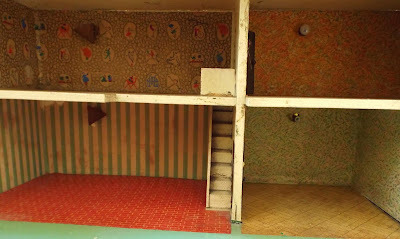 Susan has also sent photos of a brand new project she has started, of a 1940s Grocery Shop with a privy and garden round the back. 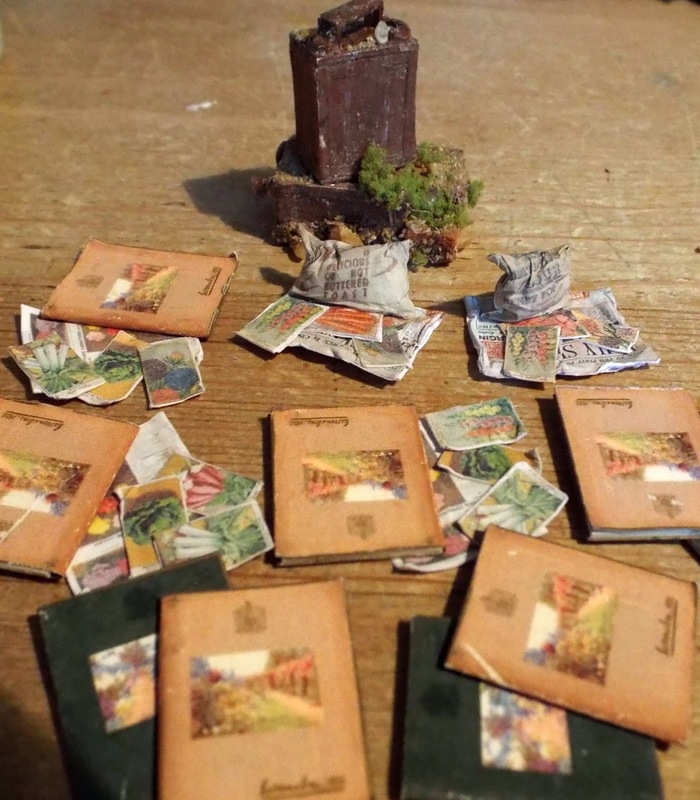 Am delighted to say that Susan has kindly allowed me to feature both these projects on the KT Miniatures Customer Creations Gallery (relevant links can be found lower down). Do take a look, not only will you find all the photos utterly inspiring but I love Susan's humour and the photos are guaranteed to make you smile! This has been based on an "East End of London" terraced house during wartime, complete with Anderson Shelter, side entrance and even alley...truly wonderful. 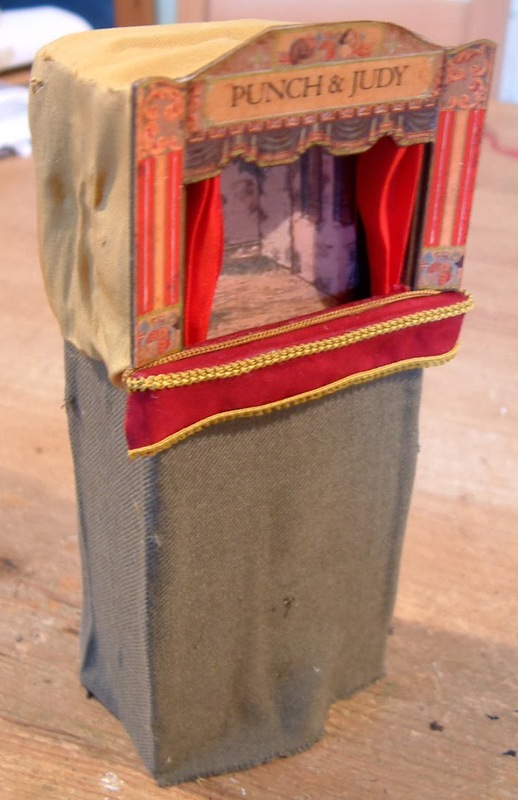 The house was made for Susan by John Burley, the dolls in both this project and the grocer shop were made by Joy of Adora Bella Minis and various items within this project have been created by specific artisans. It is particularly delightful for me to see so many of KT Miniatures' creations that I have made over the years incorporated into this project, such as the wall shelf unit above the table on the right of the living room, books, framed pictures and even a coat and hat rack that you can just see through the open door of the living room, hanging on the hall wall. Also, a wonderful example on how to mix and match antique 1/12th scale miniatures with more modern handmade miniatures, is where Susan has incorporated a 1930s German sideboard which looks well at home (seen in the photo above).....fabulous! Uncle Ted can be seen above with his old bike, talking over the fence. Above you can see the rusty side of the Anderson shelter and compost heap. 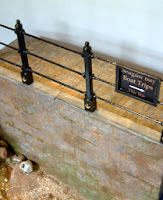 Above, you can just catch a glimpse of inside the shelter. In the alleyway the children play. Just look at William's go-kart and the pram that his baby brother is sitting in! That Home Guard chappy reminds me of a character from "Dad's Army"! All these photos says it all..........don't you think? 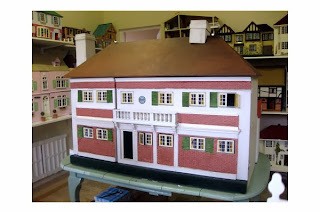 Susan's grocery shop is based in wartime Britain and created from the shell of an old dolls house that has been given a new frontage. Her uncle once owned a jewellers shop and she can remember thinking how time literally seemed to have stood still in that shop, as nothing had seemed to have changed in years. 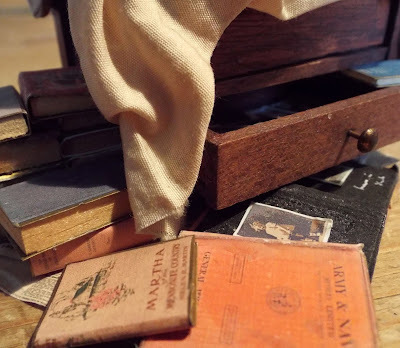 Everything was brown and worn, so that memory has given her the inspiration for this particular project. 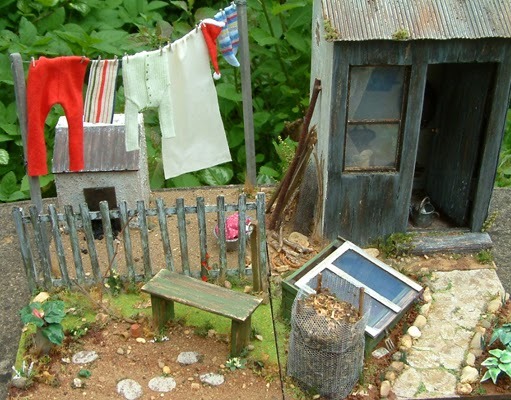 She has also created a privy and little garden at the back.....don't you just love the old lady on that loo!!! Hahaha....However, Susan tells me that this is very much a project in progress and promised to send more photos when the living quarters and other bits have been completed. 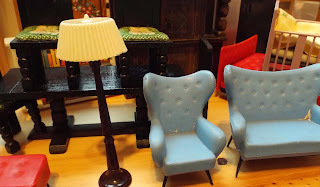 Some Rather Lovely circa 1930s Lampshades Plus Other Bits! 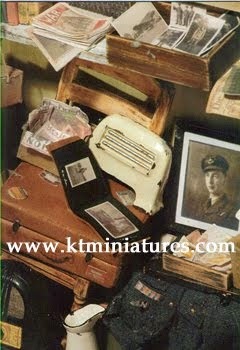 I have been busy listing some rather lovely antique and vintage pieces to KT Miniatures' website today. Amongst some of the more rather special pieces now for sale are these circa 1930s celluloid lampshades, which are becoming ever more difficult to get hold of these days. 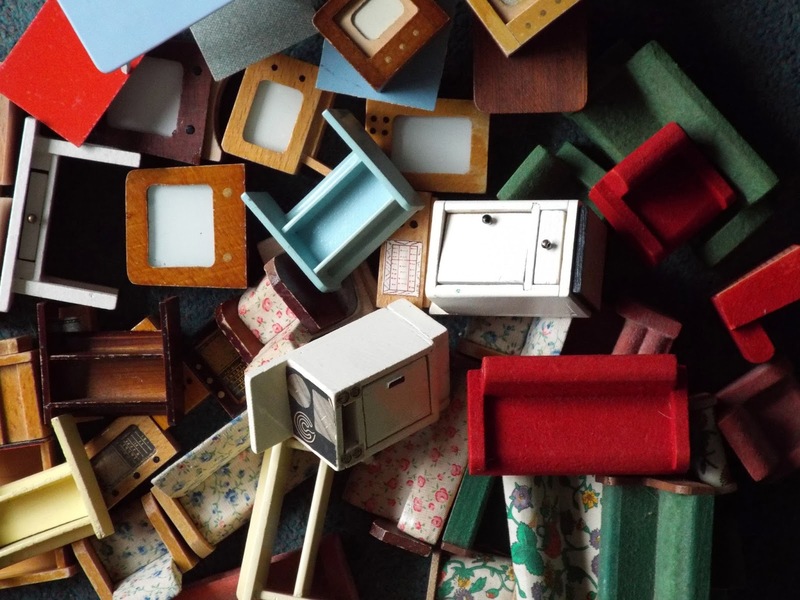 Also, because they are made of celluloid, means they are quite fragile and many are so often found split or broken entirely. 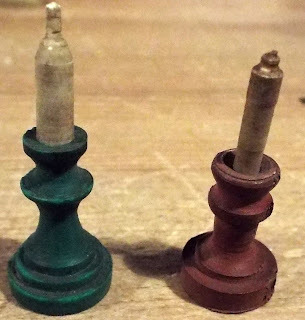 But am very pleased to say that both these....a green/white one plus a blue/white one, are in remarkably good condition. 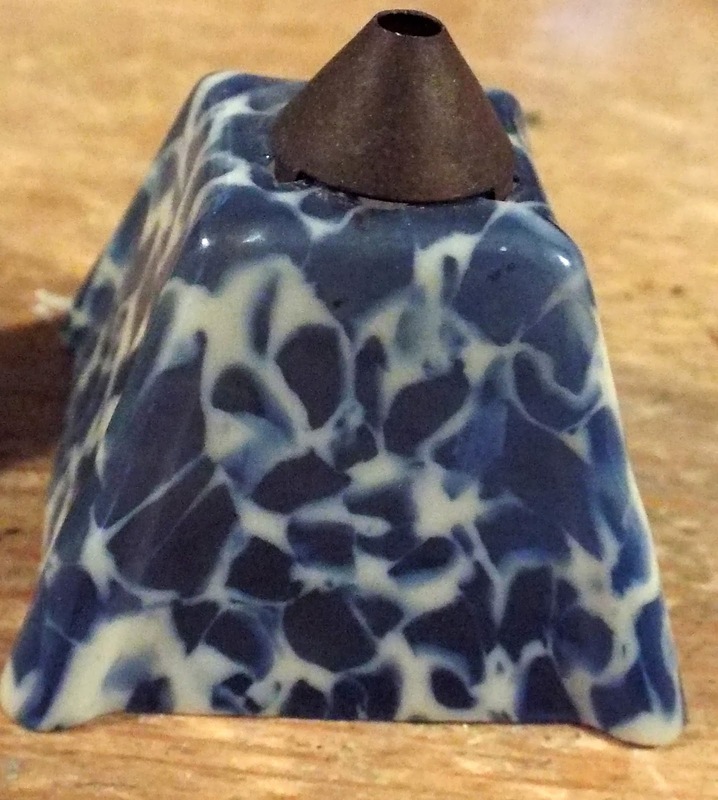 They each even have the metal conical fitment which fits on the top where the wire would feed through. Also listed today is this quite unique wooden radiator...the likes of which I have never seen before, Yes, I have seen many a radiator made out of metal but wood....no! It's magnificent! Then there is this much older handmade fretwork display cabinet, believed to originate from the early 1900s. It is rather lovely....the back flops down so that you can place your old china on the two shelves with ease. 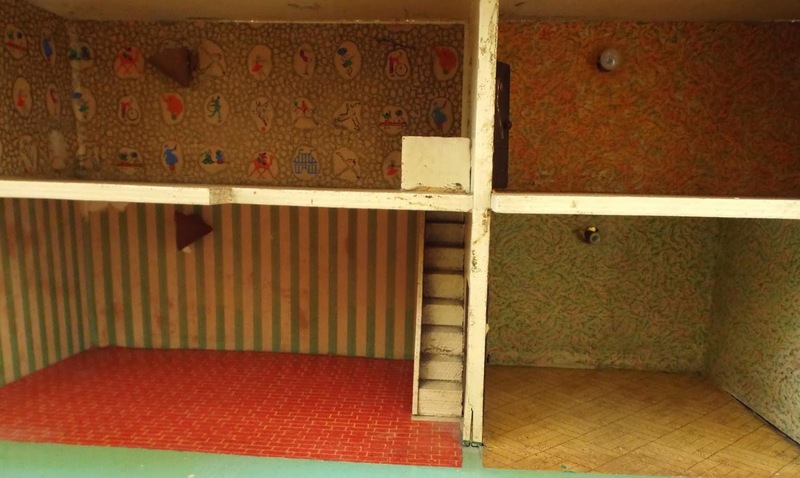 Just check out that antique green floral wallpaper inside! This old trolley is rather splendid too....all metal..in fact am wondering if it is indeed copper? 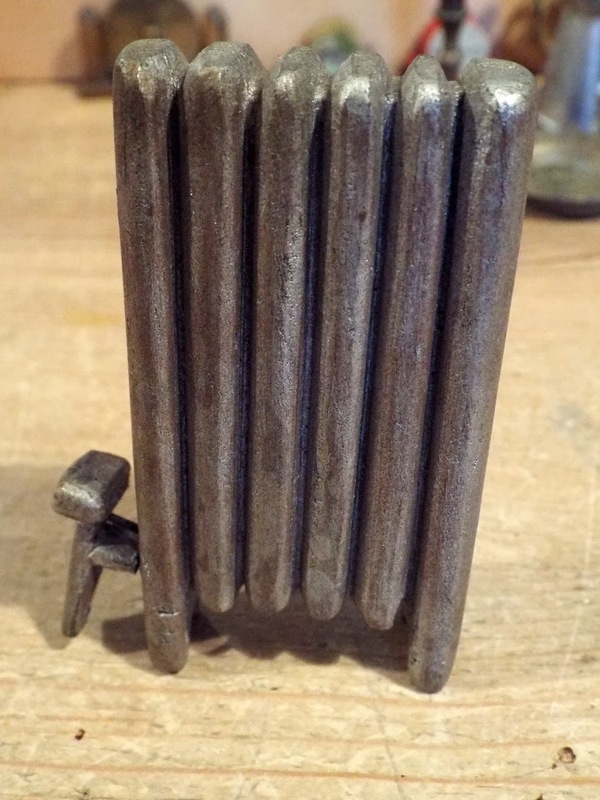 It is obviously quite old but don't have a clue to its origin. 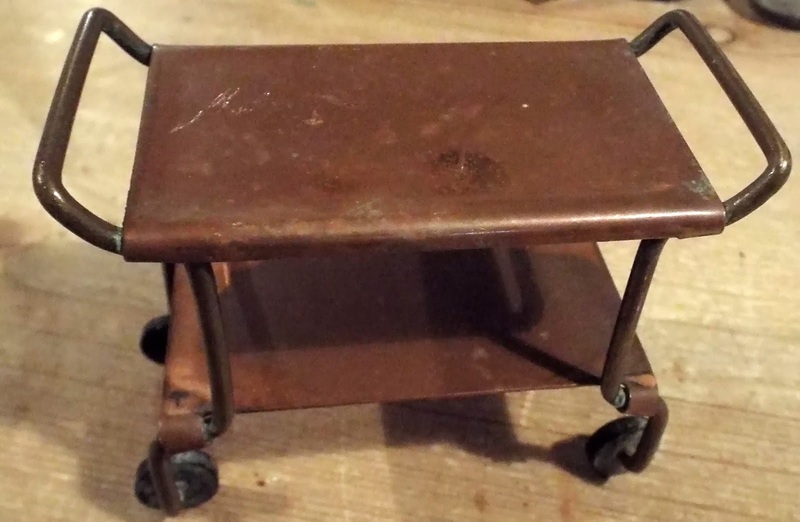 Just imagine this laden with vintage food and china for "afternoon tea"! Labels: 1930s wooden candlesticks, antique wooden radiator, circa 1930s celluloid lampshades, early 1900s fretwork dolls house cabinet, vintage metal dolls house trolley. 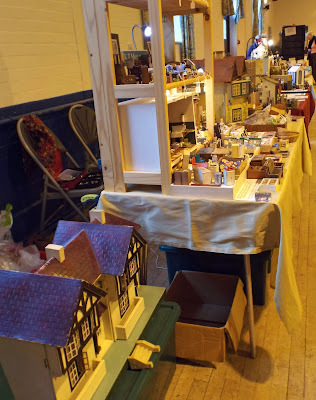 Today I have been listing one or two items of unsold stock left over from last Saturday's event, to various categories within my Exclusive Handmade Sections on KT Miniatures website. These have been made to look old so can be used in both vintage and reproduction dolls houses-most are 1/12th scale. 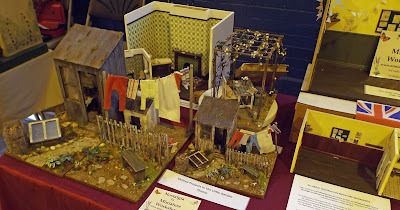 Plus the bathing machine and Punch & Judy tent that were created for the Victorian Seaside Scene that featured in several issues over the summer months in the Dolls House & Miniature Scene magazine as a "how to make project", are now for sale on KT Miniatures Shed, Outhouse & Outdoors Page. 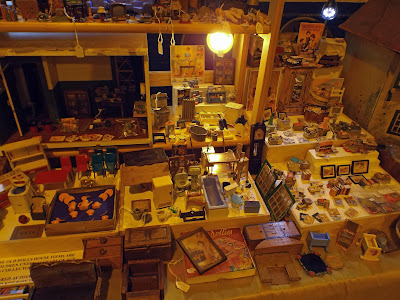 Over the next few days I will be listing various vintage and antique items that were unsold at last Saturday's event. 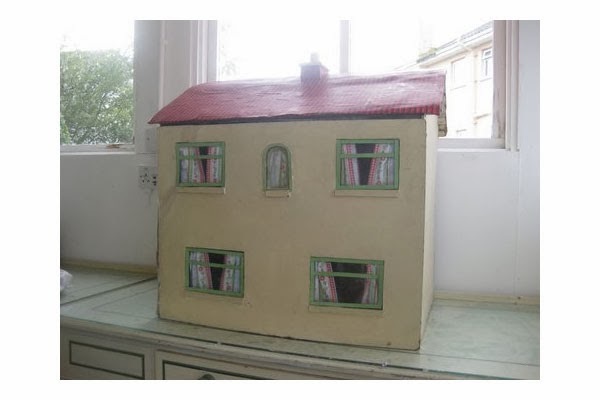 Also, I shall be putting up for sale an unusual and large dolls house that will appear in the Bargain Basement at a very reasonable price and which would make a brilliant project for someone. 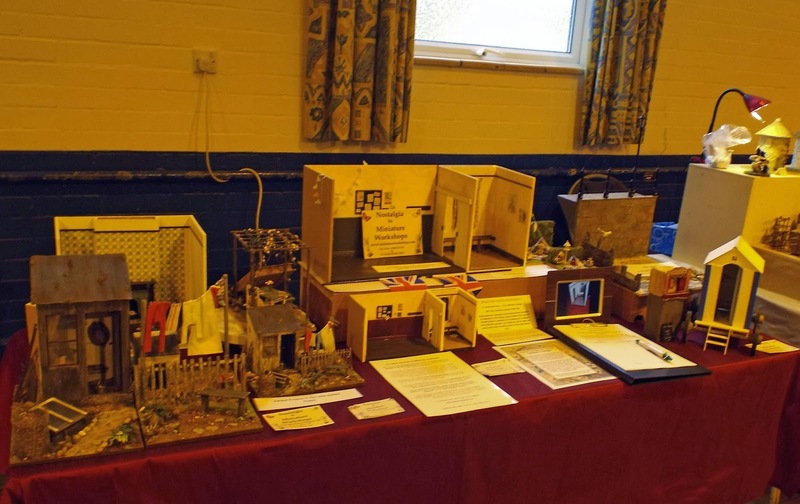 Thank you to everyone who came along last Saturday to the little Haddenham Village Hall to what was to be the very last Haddenham Dolls House Exhibition organised by Freda and George Dorrell. 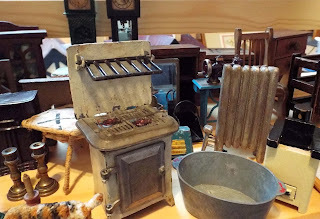 As soon as the doors opened, customers seemed to appear from nowhere and KT Miniatures' stand was rather busy until early afternoon...then finally I could stop for a breather for a late lunch! 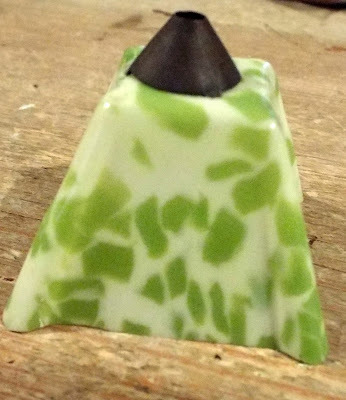 (Thank you to those customers who had to wait so politely and patiently as I dealt individually with everyone - my little helper has now deserted me for uni' so was on my own for the whole time). It was lovely to see so many of you throughout the day. These were all the photos I managed to take just before the event opened...as after that, it got a bit hectic and business was brisk, so did not get the chance to take any of the many wonderful exhibits on display! The circa 1930s Tri-ang No 62 seen here in the foreground sold within the first half hour. 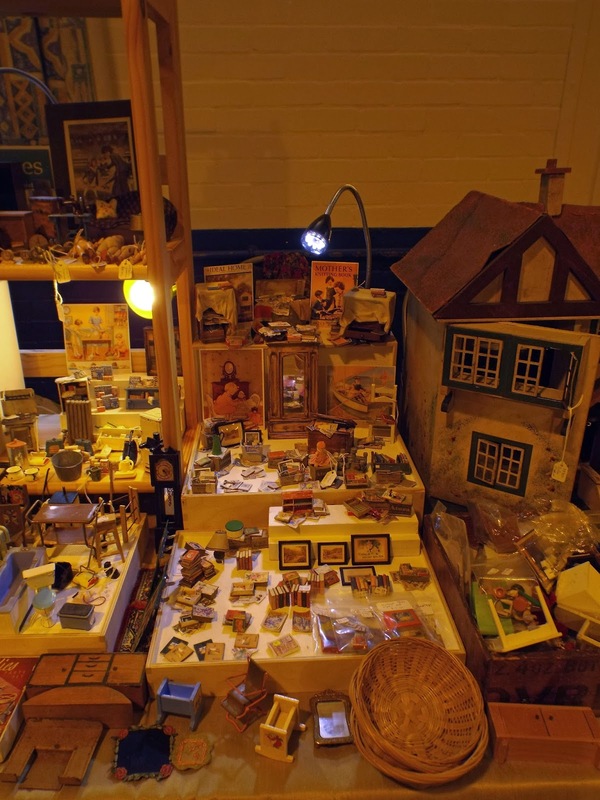 KT Miniatures' stand was filled with a mixture of both antique/vintage and my handmade items. 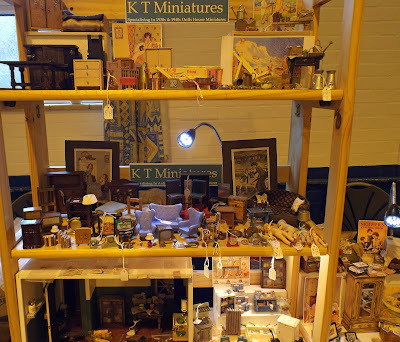 Right next to KT Miniatures stand there was a display of every single project ever undertaken at our Nostalgia In Miniature Workshops. 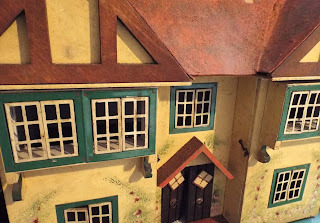 If anyone would like to receive our Nostalgia In Miniature Workshops' free monthly emailed newsletter then please get in touch with me, Celia, at info@ktminiatures.com and I will add you to our database. I understand that money raised for Hearing Dogs for Deaf People and Leukaemia Research will finish in the region of £1,000 which is fantastic....so congratulations to Freda and George Dorrell for putting on yet another splendid event. They have organised this event for many years but have finally now decided that this will be the last one. It will be missed! 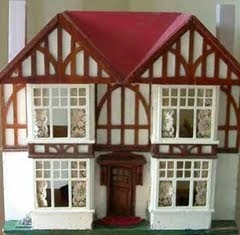 Last Minute Dolls House Addition For Haddenham Event Tomorrow...c1930s Tri-ang No 62! 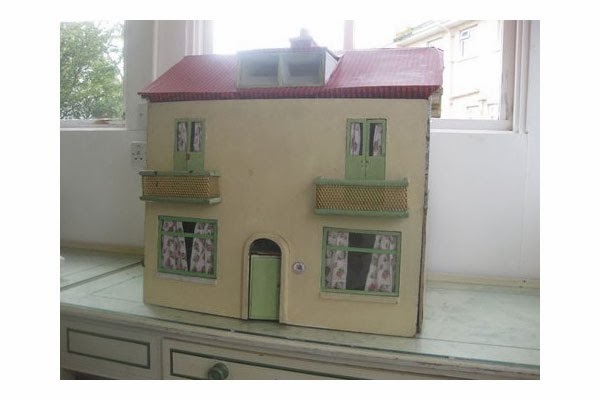 This is in addition to the already advertised 1930s Dolly Mixture dolls house, as seen in the last posting. The exterior is in completely original condition, all metal windows, chimneys, steps and two of the original lampshades are still there. 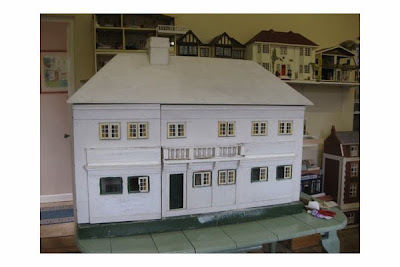 The exterior has had a coat of white plus a light green on the top part of the base. But this is lovely and just look at that wallpaper! 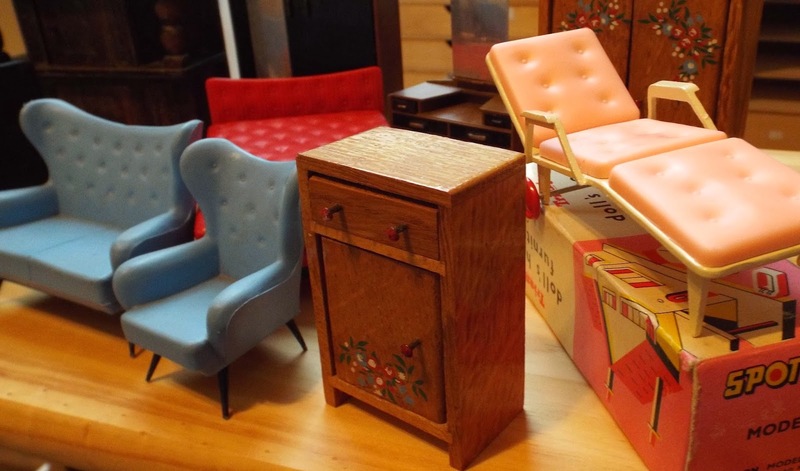 I will also be bringing a further big box of vintage low budget 1/16th scale furniture for you to rummage through, in addition to what has already been advertised. Am having a BIG clear out....bargains to be had!!!!! 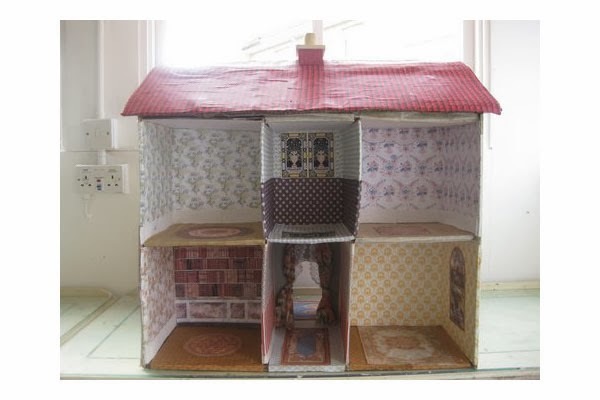 Haddenham Dolls House Exhibition Is On This Saturday-Hope You Can Come! KT Miniatures will be attending the Haddenham Dolls House Exhibition this Saturday (23rd November). 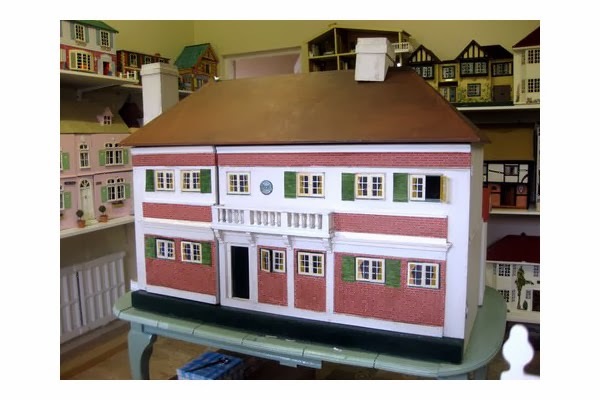 There will be various exhibits from four local dolls house clubs and individuals, several artisans with miniatures to buy, other exhibits (even a rather wonderful Lego railway), charity tables including a raffle plus there will be a sealed bid auction of a beautiful 32" long dolls house decorated by James Parker (as seen in Dolls House & Miniature Scene magazine I understand). 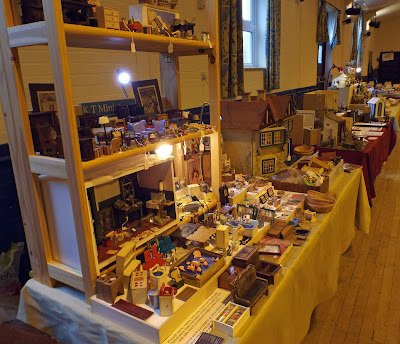 KT Miniatures will be there (of course), with most of my handmade items as currently seen on KT Miniatures website, plus in addition I am taking an abundance of antique and vintage stock that currently does not appear on KT Minitatures website! Have taken a few photos so that you can have a sneak preview of just some of the old items that will be available on the day. 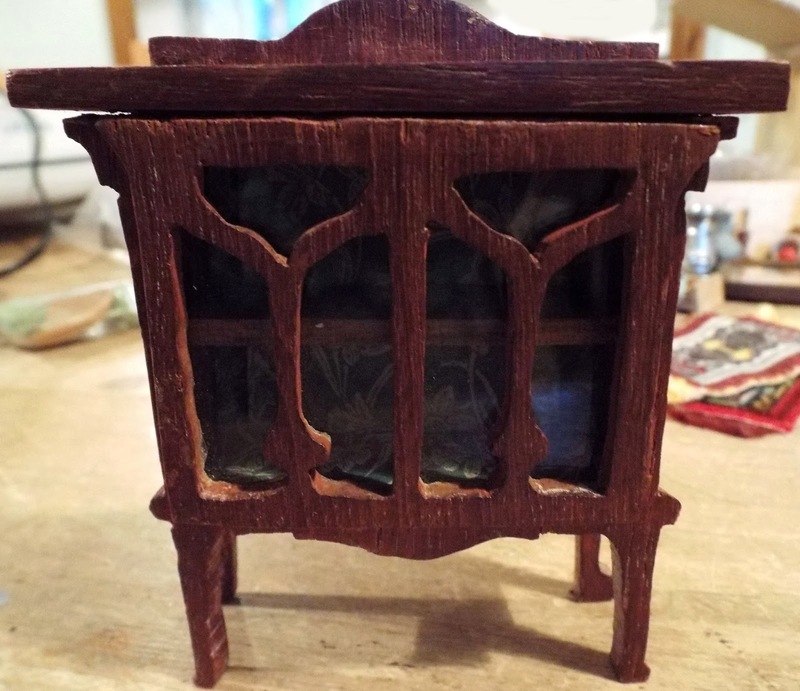 Amongst them is an early 1900s pressed German sideboard, an early 1900s fretwork display cabinet with contents, 1930s German metal sewing machine, unusual wooden radiator, bisque German dolls, clocks of various descriptions, old tea set, some T&B items such as cooker, fridge, saucepan set and some 1930s Pit-a-Pat furniture. There will also be some vintage Barton Tudor, Tri-ang and Twigg furniture from the 1960s. Further more, there will be a small scale early 1900s sink, toilet and decorative table, antique fenders....plus lots more besides! Oh....and a couple of boxes filled to the brim with random vintage miniatures for you to have a good old rummage through to your hearts content, all at bargain prices! 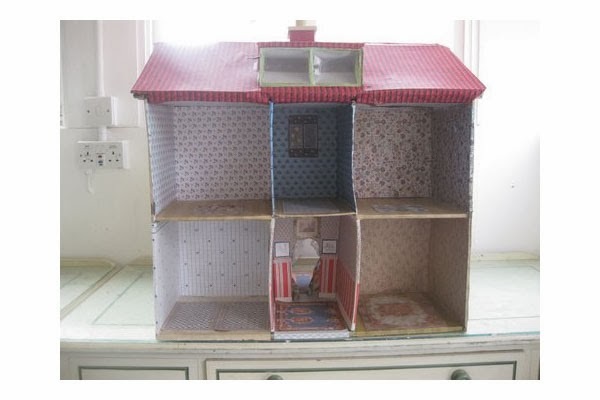 I will be taking at least one old dolls house to sell, this 1930s Dolly Mixture Dolls House. 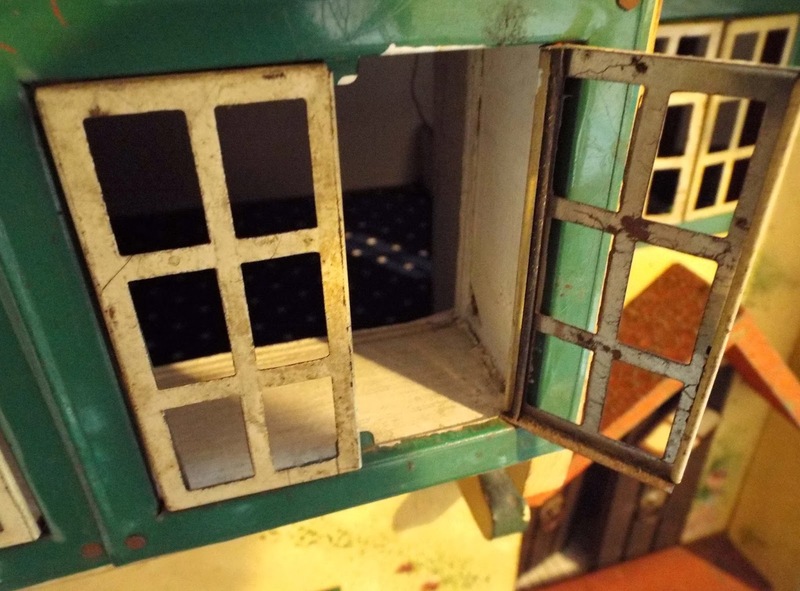 Just look at those wonderful square paned pre-war Romside windows with the rod hinges down the sides! However, as I'm only having a 6ft stand (unlike the Thame Fair where I have a 12ft stand), space will be limited. 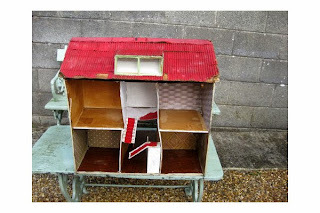 If I can fit another dolls house in the car and behind my stand, I will do so. 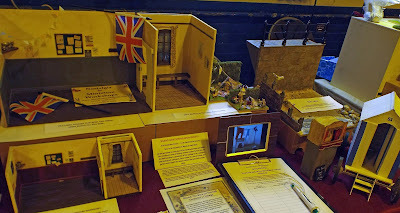 A view of various projects from "Our Little Garden Theme". Robin Britton (Coombe Crafts) and I shall also have a display of all our Nostalgia In Miniature Workshops' projects to date, in both 1/12th and 1/24th scales for you to see in all their glory. 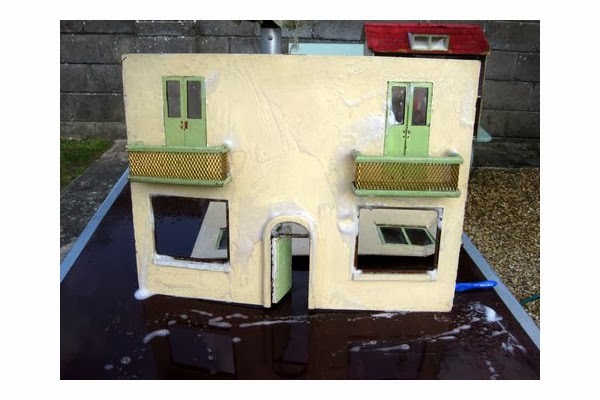 We will also be taking our Seaside Scene which as you know, was featured in the Dolls House & Miniature Scene magazine throughout the summer as a "how to make" project, and is now up for sale (50% of proceeds to be donated to Breast Cancer Campaign)...offers welcome on the day. Would make a very special Christmas present for someone! Plus we shall have news of our Spring Workshop including details of a brand new and very exciting workshop venue! 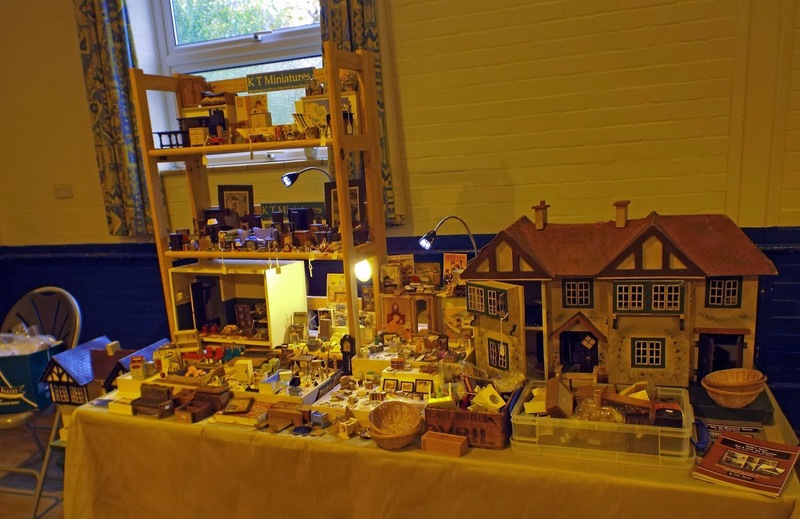 This display will be situated in between both Coombe Crafts and KT Miniatures stands so both of us will be on hand throughout the day if you would like to know more about our workshops. As already mentioned before, Haddenham has it's own train station just 15 mins walk from the village hall. Thame is only 2 miles away and Aylesbury approx 5 miles away. 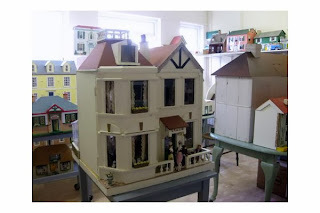 Labels: Haddenham Dolls House Exhibition, Nostalgia In Miniature Workshop. Over the past two weeks I have been listing multiple groups of Dol-Toi, all from Marion Osborne's Collection. 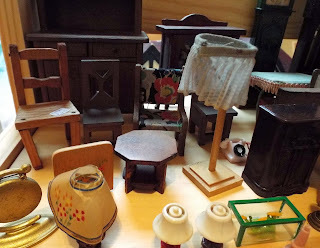 Marion collected these items over many years to help in her research on Dol-Toi, culminating in her writing a unique book - The Book Of Dol-Toi - Dolls House Furniture & Accessories (available exclusively from KT Miniatures). Consequently once the book was written, there were boxes and boxes of literally all kinds of Dol-Toi furniture and accessories left surplus to Marion's requirements....so I have had the enviable task of selling all the items on her behalf. Well.... it is over a year now since I started selling Marion's Dol-Toi and although the majority of more rare items have long been sold, I still have boxes and boxes of wonderful Dol-Toi furniture and accessories available to purchase. Over the next few weeks I shall continue to list multiples of these items at very reasonable prices (would make ideal Christmas presents for the collector of 1/16th scale dolls house furniture)! If you click on the following link, it will take you through to the current Dol-Toi page. 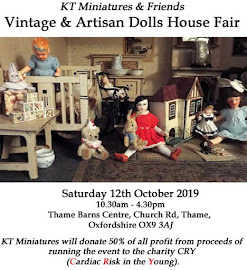 All listing of new stock to KT Miniatures' website will now cease for an entire week, just in the run up to the lovely Haddenham Dolls House Exhibition which is taking place next Saturday (23rd November). 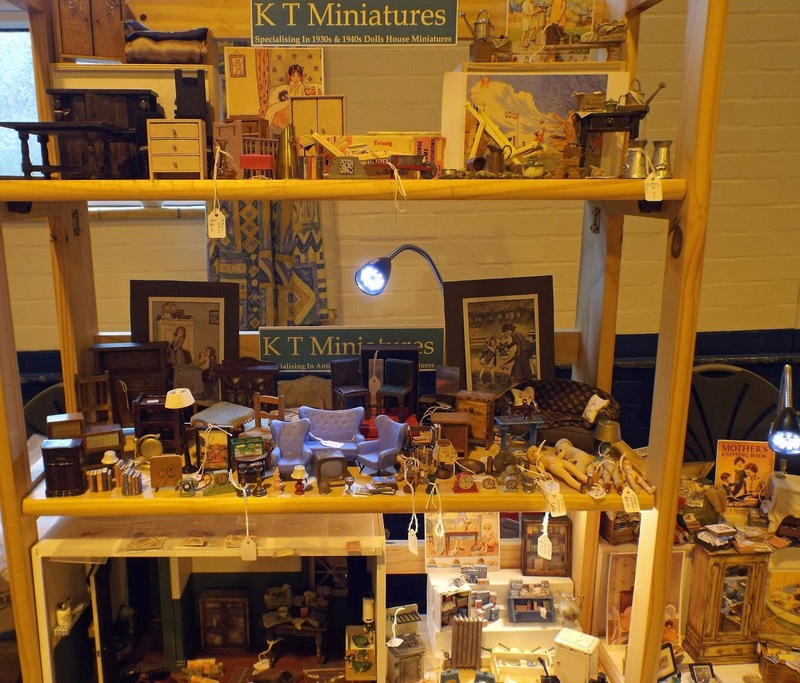 KT Miniatures will be having a 6ft stand plus we also hope to have an exhibition of all of our Nostalgia In Miniature Workshops' projects, since our workshop initiative began. Haddenham is 2 miles out of Thame and approx 5 miles from Aylesbury. It has its own train station - Haddenham & Thame Parkway which is just approx.15 mins walk away from the village hall- there is also a taxi rank at the station. Please Do Take A Peek & Be Inspired! 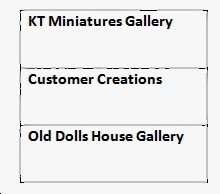 Regular visitors to KT Miniatures website will be familiar with the various Galleries, all are there with the aim to inform and inspire. 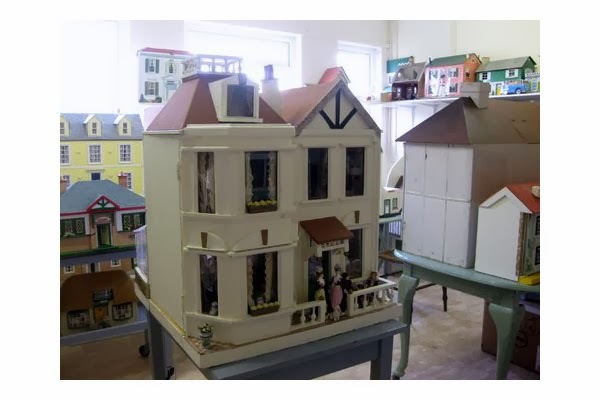 They include some customers' own inspirational creations and gorgeous old dolls house collections. You will find the Galleries section at the very top navigation bar. As you place your cursor over the Galleries button, a drop down bar with three options will appear. So then simply click on the the relevant section. 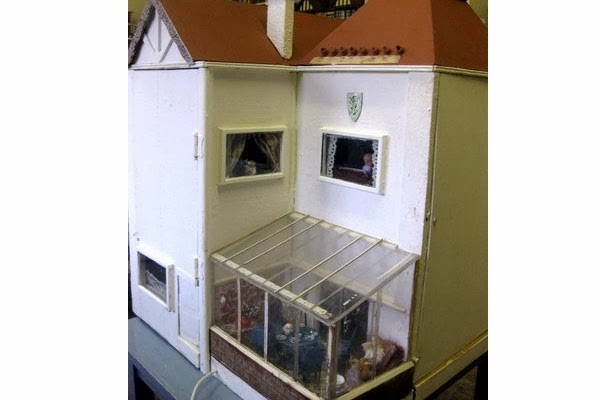 Collection Three belongs to Barbara Kendall-Davies, a retired opera singer from Jersey, who sent me some more wonderful photos of three very different dolls houses from her enormous collection to add to the existing page that already features some of her gorgeous houses. 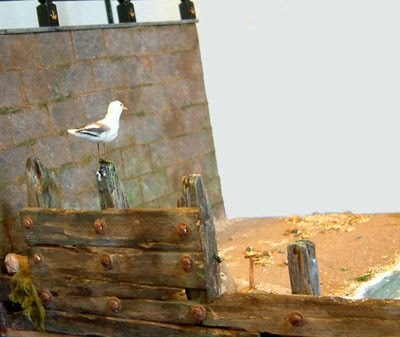 Her husband has nicknamed her collection "Barbaraville". She did a magnificent job! 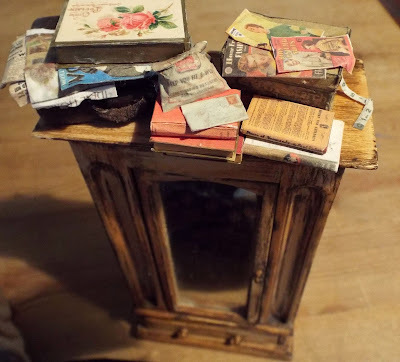 Barbara allows us to take a peek inside the rooms and shares some of her restoration techniques such as how she diluted the brand new craft paper flooring upstairs with coffee! Barbara has had this house for a very long time and it has actually featured on the gallery page for many years now. However, Barbara sent some updated photos as she has had a bit of a shift around with furniture and furnishings, as I suspect like many of us do with our old houses from time to time (I certainly do). 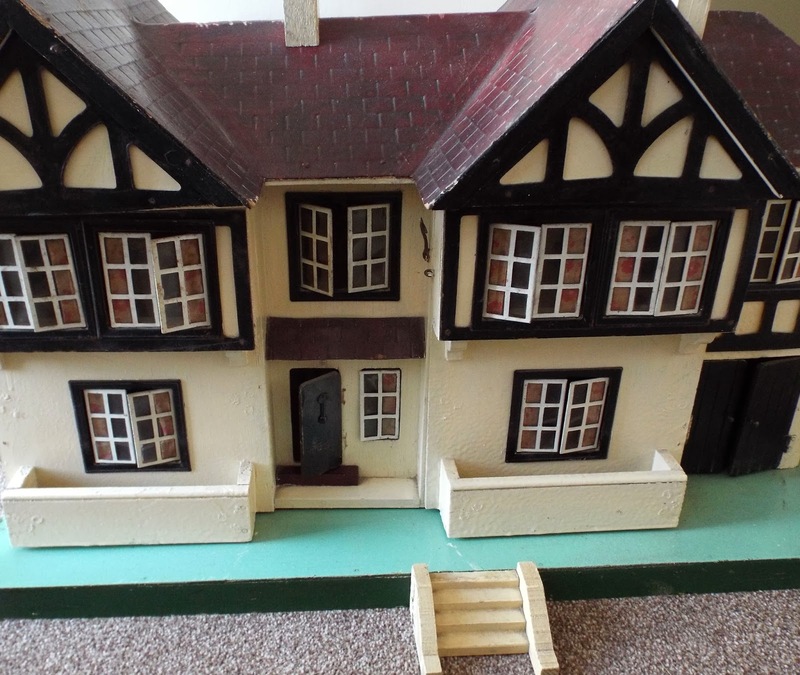 She tells us that this house is a bit of a mystery, and that although the facade conforms to the one that appears in the 1909 catalogue, strangely it opens each side instead of the front. When she acquired it, it came with an added conservatory on the back so she has kept it like that. I actually quite like the conservatory and think it gives the house extra character. Now this restoration project is a testament to Barbara's patience and perseverance.....I suspect many people would have simply binned this old house with cardboard interior walls and floors, but not Barbara. It belonged to a member of her dolls house club in Jersey, whose grandfather had made it many years previously and consequently been sitting up in a loft for a very long time. The owner didn't want it, so Barbara took it on. 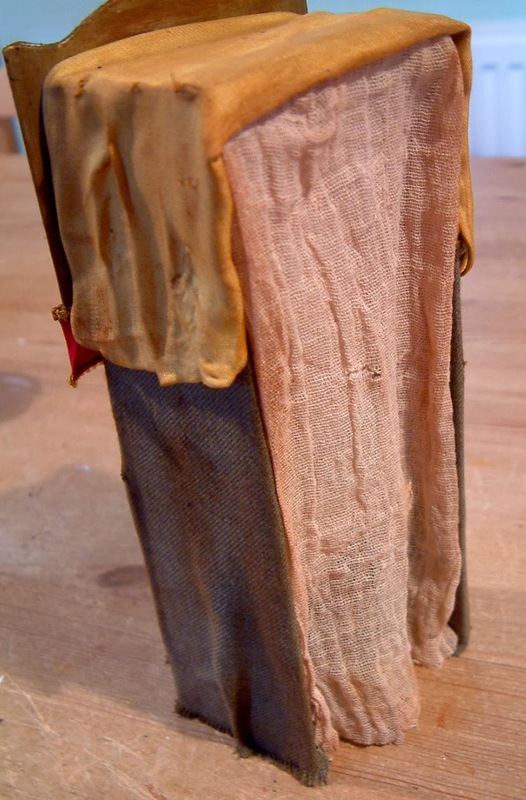 Again, Barbara gives us an insight into some of her restoration techniques, which are inspiring. For instance, she used printed pocket handkerchiefs for the curtains and downloaded some of the papers from the internet. 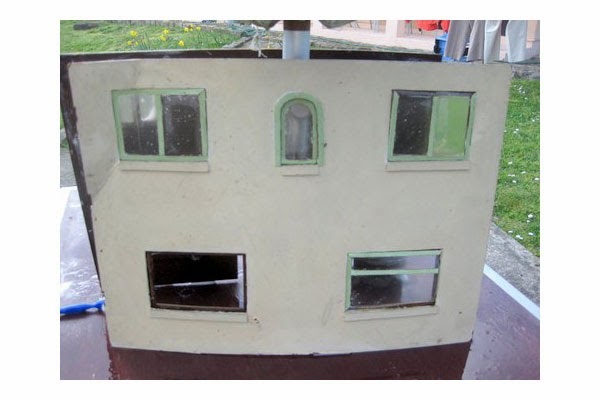 She tells us that she spent hardly any money on the restoration, just many hours of labour. 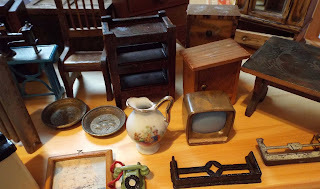 To furnish it she used bits and bobs, plus customised some cheap plastic furniture from Pound Land. 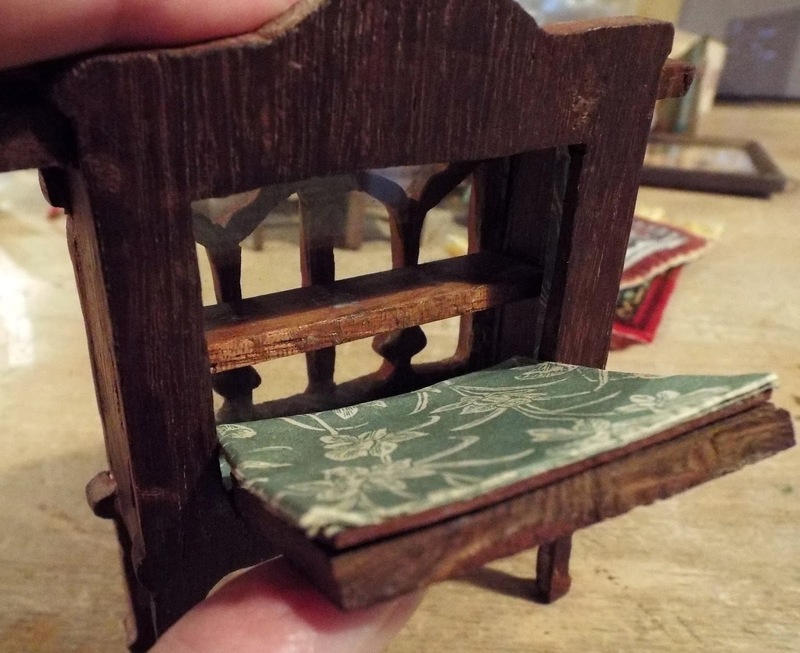 I think it is very pretty indeed and a perfect illustration on how a real wreck of a dolls house can be rescued and made to look beautiful once again. To view the main Old Dolls House Gallery Index, please click on the following link, not only will you find old douses but there is also a page of the rare previously sold Beatrice Hindley plants and the very recent collection of Grecon dolls which included some rare ones.